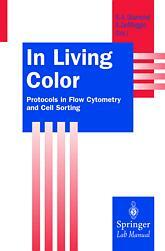 The goal of this book is to make the increasingly valuable technology of flow cytometry accessible to researchers, including the students, post-doctoral scholars, and technicians who labor in the fields harvesting the grains of knowledge inherent in this integration between analysis and physical isolation/purification methodologies. A step by step approach to the methodology for measuring various cellular attributes demonstrated in the particular cells of interest is provided. In addition a myriad of resources to fuel the curiosity and answer questions of both the newand adept user is presented. The vision for this book stems from the editors' experiences managing flow cytometry/cell sorting core facilities for the emerging researchers, in particular in developmental, cellular, andmolecular biology. Feel free to explore the book contents, index, and web resources via this web site before you purchase it.